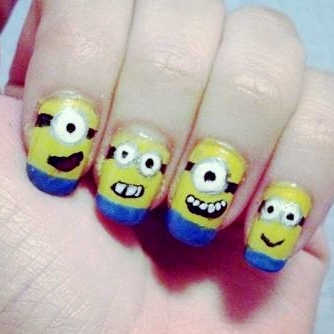 Touch Of Belle : Despicable me minion nails! Despicable me is one of my favourites! The storyline is so cute and who doesn’t love the yellow minions! So I decided to turn my own nails into mini minions! Step 2: once your nails have dried paint the bottom part of your nails blue, you can use tape to cover the yellow parts or if your feeling brave just paint away! Step 3: you need a toothpick or something similar and dip it into your grey paint, I carefully dotted the polish on each nail to create the “goggles” I did one goggles on some and two on other- its up to you how many you want to do. Step 4: after the grey had dried I made smaller dots inside the grey goggles using the white polish. Step 5: with the smaller end of the toothpick I made the eyes of the minions I also did the mouths and goggle bands too. And there you go your have your very own minions!